Several months ago I told you that because of my revised view of my 2001 study of reparative therapy changing sexual orientation, I was considering writing something that would acknowledge that I now judged the major critiques of the study as largely correct. After discussing my revised view of the study with Gabriel Arana, a reporter for American Prospect, and with Malcolm Ritter, an Associated Press science writer, I decided that I had to make public my current thinking about the study. Here it is. 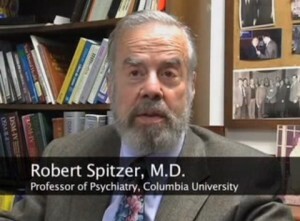 Dr. Spitzer’s apology to the victims of “pray away the gay” therapy and the greater LGBT community marks a watershed moment in the fight against the “ex-gay” myth. We commend him for it, because not only will it solidify his legacy as a respected doctor and significant historical figure, but it will help to greatly hasten the day when the scourge that is reparative therapy is eradicated forever and LGBT people can live openly, honestly, and true to themselves.